ENO SingleNest OneLink Hammock Sleep System. A comprehensive outdoor system that allows you to set up in minutes, lie down for hours, and enjoy all that Mother Nature throws your way. You won’t miss a sunset, a sunrise, or go a moment without proper rest. ENO now offers the OneLink Sleeping System. This comprehensive package includes a SingleNest hammock, Atlas hammock suspension system, Guardian BugNet, a rain tarp, as well as a set of Easton Aluminum Tubular Tent Stakes. 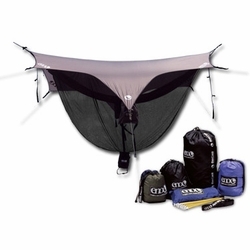 The entire system comes ready packed in an authentic ENO sack, easy for travel and for fun. Wherever you are and what ever you are doing, be prepared for all the things you didn't plan for with the ENO OneLink Sleeping System. When you purchase the OneLink sleeping system, you purchase safety, exceptional quality, and a complete hassle-free outdoor experience. The system comes complete with everything, even bragging rights. Eagles Nest Outfitters. Welcome to four-season hammocking in winter conditions.